In the aftermath of last Thursday’s trade that sent J.T. Realmuto from the Marlins to the Phillies, I’m started to look into how much of a hit Jorge Alfaro’s fantasy value would take going from Citizens Bank Park to Marlins Park. The exercise turned out to be a convoluted mess. Ultimately, it led to a finding that could prove useful in identifying players who are due for spikes or dips in their power numbers. With the dramatic change in park factors, I started out by trying to find a similar hitter from the Marlins in 2018 to find a comp for Alfaro’s new projection. I needed to identify hitters with signs of raw power, since Alfaro ranked in the top 20 percent in hard-hit rate (percentage of batted balls hit with an exit velocity of at least 95 mph). He was also just outside the top 20 percent in exit velocity on flyballs and line drives, (min. 150 batted balls) and just missing the top 10 percent in average flyball distance (min. 25 flyballs). In stacking Alfaro up against the 2018 Marlins, two hitters stood out: Justin Bour and Brian Anderson. All three were in the same neighborhood in terms of exit velocity on flies and liners (EV FB/LD), and Anderson had a similar hard-hit rate. (I did not have Bour’s hard-hit rate for the portion of the season he spent with the Marlins.) However, while Bour’s average flyball distance was merely one foot short of Alfaro’s, Anderson’s was a whopping 31 feet lower. NOTE: Data are for plate appearances with the Marlins, except for Jorge Alfaro. This made no sense to me, so I put aside the Alfaro projection to figure out what was going on here. 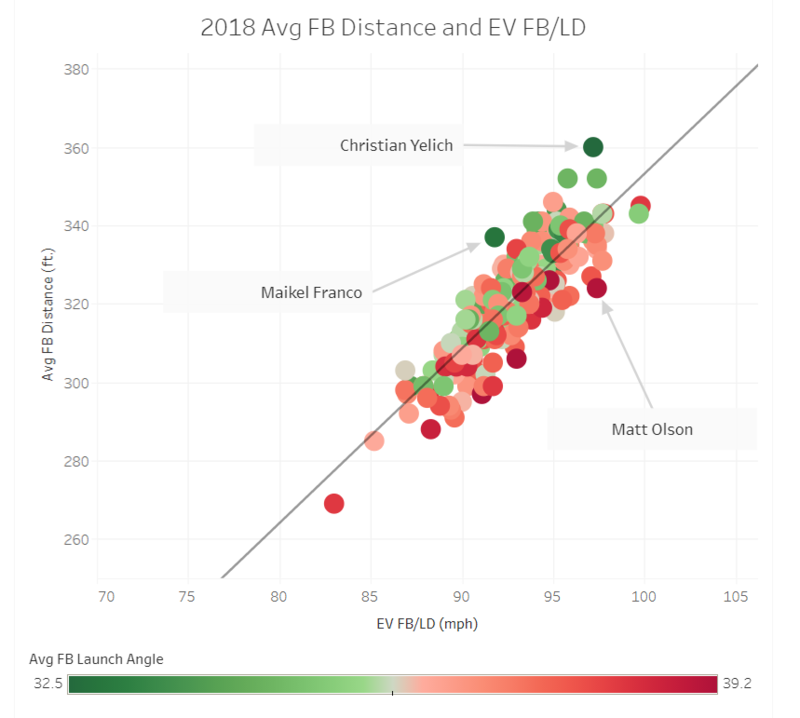 Both EV FB/LD and average flyball distance have a strong positive correlation with ISO and HR/FB, so it seemed unlikely to me that they could be so loosely related to each other. The first idea I had was that maybe Anderson was hitting too many of his flies a little too high, robbing the ball’s path of some horizontal distance. I regressed average flyball distance against EV FB/LD for all hitters who had at least 50 flyballs in 2018. In putting the results in a scatterplot and color coding each player according to their average launch angle on flyballs, I learned two things. First, average flyball distance and EV FB/LD do have a strong positive correlation. It also appears that the hitters who have a much greater average flyball distance than would be predicted by the regression were the least prone to hit ultra-high flies. Take a look at how much more distance Christian Yelich and Maikel Franco got on flies last year as compared to what the regression equation would predict. Then notice how much lower their average flyball launch angle was than everyone else included on the graph. Similarly, there were several players at the high end of the flyball launch angle continuum, like Matt Olson, who appeared to get cheated on their flyball distances. The table below shows all of the hitters whose actual average flyball distance was at least 15 points above or below their estimated average distance. The average flyball launch angle for hitters with at least 50 flyballs in 2018 was 36.4 degrees, but every one of the five distance underachievers had a higher-than-average launch angle, and four of them clocked above 38 percent. Meanwhile, the three distance overachievers were all under 35 percent, with Yelich and Franco finishing below 33 percent. Minimum 50 flyballs. Overachievers in bold. This alone doesn’t tell us what to expect from these hitters in 2019. Should we expect Olson and Anderson to hit for less power than their exit velocities would indicate? Will Yelich pummel low flies on his way to another MVP season? Data from the last four seasons indicate otherwise. Players who are at the extremes of the flyball launch angle spectrum tend to regress by approximately two percentage points the following season. (Note: If you want to test this out, the regression equation is Year 2 FB LA = 25.98+ (0.29 * Year 1 FB LA). The Pearson’s r for this relationship is 0.287, which has a p-value below .0001.) That means we can probably look forward to Yelich hitting more high flies and fewer extra-base hits and Olson hitting more low flies and more extra-base hits. Before we get too carried away with those assumptions, let’s check in on the 2017 hitters whose average flyball distances were the furthest from their estimated average distances and see if they corrected themselves in 2018. The five hitters in the table below were the biggest flyball distance underachievers among those who had average flyball launch angles of at least 37 degrees in 2017 and hit at least 50 flyballs in both 2017 and 2018. Everyone in this underachiever group increased his average flyball distance last season, and Max Kepler, Dansby Swanson and Avisail Garcia increased their distances by more than 10 feet. For all three of those hitters, you can see that their 2018 average flyball distance tracks more closely with their 2017 estimated average than with their 2017 actual average. The only player in this group whose average flyball launch angle did not regress back towards the major league mean was Kepler. For us fantasy owners, greater flyball distances don’t mean much if they don’t translate into an increased rate of extra bases. Cain’s ISO actually dropped by 31 points, but that can be tied to a more than 10 percentage point gain (from 44.4 percent to 54.6 percent) in ground ball rate. Kepler’s and Hernandez’s gains in ISO were modest, though Hernandez did increase his HR/FB ratio from 12.6 percent to 14.6 percent. That leaves Kepler as the only hitter in this group who maintained or decreased his ground ball rate and did not experience some type of notable increase in power production. Recall, though, that he was also the only one who did not have the expected regression in flyball launch angle. As Ben Kaspick pointed out in a recent column, Kepler looks like a sneaky value pick in upcoming drafts. He appears due for more low flies and extra-base hits. We see a similar pattern of regression in flyball distance and flyball launch angle with the top flyball distance overachievers (average 2017 flyball launch angle below 36 degrees, min. 50 flyballs in 2017 and 2018). Of these six players, five hit flyballs for shorter distances on average in 2018, and four decreased their average distance by at least 12 feet. Four of these hitters also had substantial decreases in their ISOs from 2017 to 2018. Carlos Gonzalez, whose ISO increased by 28 points, was an exception, but according to xStats, his expected home run total was just 11.3, as compared to his actual total of 16. Stephen Piscotty went even farther against the grain, increasing his ISO from .132 to .223, even though he hit flies six feet shorter on average. This is a tough one to figure out, but Piscotty appeared to have padded his home run total by hitting more flies at the parks of the Athletics’ divisional rivals. Every one of those venues rated as above average for home run park factor for right-handed hitters in 2018, and Piscotty posted a 38.7 percent ground ball rate and a 19.4 percent HR/FB ratio across those parks. At home, he had a 46.8 percent ground ball rate and a 15.4 percent HR/FB ratio. Pham’s ISO corrected itself, even though his average flyball distance actually went up by a foot. However, he looks to be due for an additional decline in 2019. He outperformed his estimated average flyball distance by 12 feet in 2018, just as he did in 2017. Not only did Pham’s average flyball launch angle not regress last season, it got even lower. Looking back at 2017’s flyball distance over- and underachievers, players like Cain and Piscotty are the outliers. Most of the hitters who had average flyball distances that were out of synch with their average exit velocity on flyballs and line drives saw their ISOs adjust in 2018. That bodes well for players like Olson, Anderson and Engel to receive a power boost this season, and less well for Yelich, Desmond and Franco to match their power output from a season ago. The fantasy implications for Yelich are clear, as he may hit nine or 10 fewer homers than he did last year. That puts him just outside my top 15, rather than as a top eight player overall, as he is being treated in early drafts. We hoped you liked reading Using Flyball Launch Angle to Spot Risers and Fallers by Al Melchior! Did you ever get back to the Alfaro analysis and come to a conclusion? Yes! There wasn’t really a good comp on the 2018 Marlins, because Alfaro has exteme oppo% and K%. The closest comp I could find anywhere was Cory Spangenberg: high K%, high oppo%, high BABIP, pitcher-friendly park. Figuring Alfaro will get approx. 500 PA, I expect he will bat .235 with 11 homers (I previously had him projected for 13).